Crafted in steel reinforced polyresin with precise attention to detail! Presented with wood wall display featuring graphic motif of Manu Bennett's Azog the Defiler. An awesome replica of the primitive but brutal weapon! Azog's primary weapon in Peter Jackson's The Hobbit film series is his war mace. 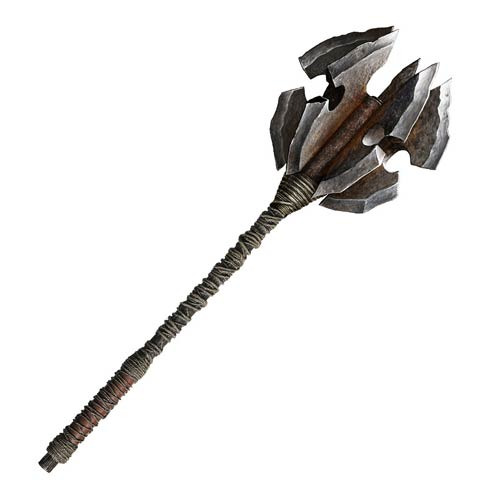 A primitive but brutal weapon, the mace was constructed of wood, leather, cord, and rough forged steel. This The Hobbit Mace of Azog the Defiler Prop Replica is based on the prop and models used by actor Manu Bennett. Crafted in steel reinforced polyresin with precise attention to detailing, it measures 41 3/4-inches long x 12 1/2-inches in diameter. The Mace of Azog the Defiler Prop Replica is presented with a polystone wall mount featuring a graphic motif of Azog's tattoo scars. Ages 18 and up.